SAN DIEGO (AP) — Two-time America’s Cup-winning skipper Jimmy Spithill is experiencing what many athletes in mainstream sports go through: free agency. Odds are pretty good he’ll stay with Oracle Team USA, which staged one of the greatest comebacks in sports to defend the America’s Cup in September on San Francisco Bay. But having won the America’s Cup twice before turning 35 makes Spithill a hot commodity. During an appearance in San Diego, Spithill said that while he’s been in talks with software tycoon Larry Ellison to return to Oracle Team USA, he’s also had overtures from other syndicates as they scramble to fill key roles for the 35th America’s Cup, which probably won’t be sailed until 2017. He’d like to have an agreement in place within a few weeks. Spithill certainly has leverage. At 30 years old in 2010, the Australian became the youngest skipper to win the America’s Cup when Oracle beat Alinghi of Switzerland. In September, he steered Oracle Team USA to its remarkable comeback against Emirates Team New Zealand on San Francisco Bay, rallying from an 8-1 deficit to win 9-8. “It’s a business. I’ve always looked up to athletes that are able to get the results on the sporting field and also are able to make really smart business decisions,” said Spithill, whose wife, Jennifer, is from San Diego. 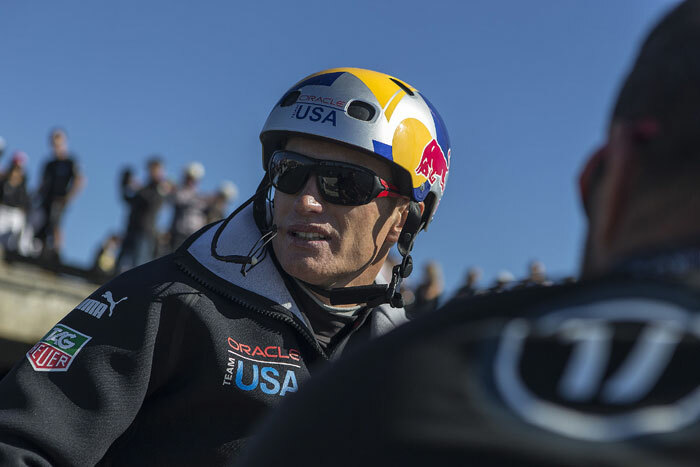 Spithill spoke highly of Ellison during an interview and in a speech at the unveiling of the second phase of a sailing exhibit at the San Diego Hall of Champions. Sailed in space-age 72-foot catamarans with a spectacular backdrop of the Golden Gate Bridge, Alcatraz Island and the San Francisco skyline, the 34th America’s Cup was the longest, fastest and wildest in the event’s 162-year history. Despite some rough times during the buildup, including the death of Bart Simpson when Artemis Racing’s catamaran capsized during training, the successful finish helped fulfill the goal of Ellison and Oracle Team USA CEO Russell Coutts to modernize the regatta. Ellison has yet to decide if the America’s Cup will return to San Francisco, although Oracle Team USA is in talks with the city. The venue must be picked before other key decisions are made, such as the year, the kind of boat and the format. Spithill said the concept and style of racing that made the 34th America’s Cup such a success will be back, although no one knows yet whether the 72-foot foiling catamarans will return, or if a smaller boat will be used. Organizers want to reduce costs to attract more teams. Only Oracle and four challengers entered the 34th America’s Cup. Coincidentally, Spithill said the one team that hasn’t contacted him is the Australian challenger from Hamilton Island Yacht Club. Australia last challenged for the America’s Cup in 2000, when its low-budget effort was led by Spithill, who was then 20.